2 How Are Newborn Baby Screening Test Carried Out? After a nine month long wait, your little bundle of joy is born and he has gifted you the most precious feeling in the world-the feeling of being a mother. It is only natural that you want and wish for only the best for your little bundle. The care that a mother put in begins from the time she conceives. The first thought that comes to any mothers mind when her baby is born, is whether the baby is fine, is everything normal? And this is where newborn baby screening test helps you resolve all your concerns. A newborn that is just a few minutes old will be apparently healthy and he may not show any visible signs of an underlying problem. This is where postnatal screening tests come in. Each baby is subjected to a set of tests that detect rare but serious health conditions. This is now a vital part of basic baby care. Screening tests include hearing tests, blood tests for genetic diseases and screening tests for heart diseases. 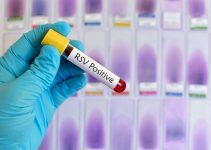 The results of these tests are negative in most of the cases and only one third of the cases test positive. Health screening for infants helps in early detection and better management of the positive cases. They serve as the first step and if required further investigations can be done. Majority of the children who are identified to have some newborn abnormalities and treated very early on in life, recover with healthy growth and development. Each state has a set of health and genetic screening that it decides as a standard protocol which also includes the basic newborn baby screening test. This is because there are many concerns like the cost of the tests, the payment method, medical insurance coverage etc. As a result each state does not cover all types of newborn screening tests. How Are Newborn Baby Screening Test Carried Out? After the child is born, the nurses will take the baby to carry out the hearing and cardiac screening tests. A blood sample will be taken and sent to the laboratory for analysis. 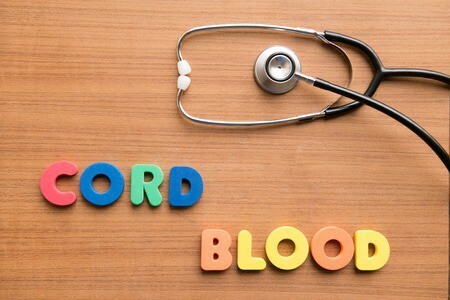 If there is a family history of certain genetic disorders, then those tests will also be added to the blood testing schedule. 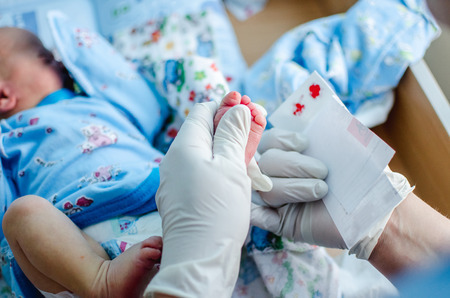 The results of newborn screening laboratory will be sent to the baby’s treating doctor. After 2 to 3 days you will be discharged from the hospital and your paediatrician will contact you in case any report is found positive. In normal cases, the baby will have a follow up after 2 weeks for vaccination, weight check etc. During this visit the results of the screening test will be conveyed to the parents and the need for further investigation will be explained where ever necessary. In most of the medical setups, screening tests of babies are a part of standard medical protocol and it is carried our for each and every child. The parents have to sign a consent form at the time of admission, and these tests are included there. The baby receives health screening even if the parents do not have medical insurance. Blood tests: Blood test for newborn is carried out by making a small and quick prick on the heel of the baby and a blood sample is collected for testing. It is also called as the heel prick test. In order to make the procedure less painful for the baby, always feed the baby before the procedure and hold the baby close to you so that he is warm and comfortable. The prick will hurt just a little. Apply pressure on the pricked area and the baby will be fine. The blood test is usually performed 24 to 48 hours after the birth of the child because in the first 24 hours, certain conditions may remain undetected if the testing is carried out. Otoacoustic emissions test is carried out using a small earphone and a microphone. They are inserted into the ear of the baby and sounds of different types are played. If the baby reacts to the sound, it proves normal hearing, else hearing loss. In the test, echo gets reflected back which is picked up by the microphone. However, if no echo gets detected, then it indicates a hearing loss in the baby. 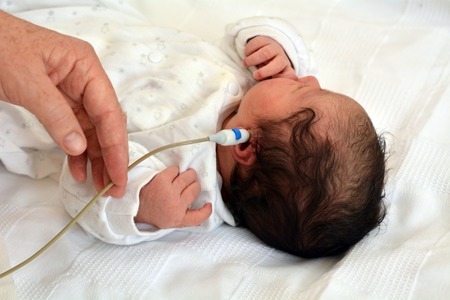 Auditory Brain Stem Response is the second newborn hearing screening test that is used for assessing the auditory brain stem and the response of the brain to the sound waves. Small earphones are then placed within the baby’s ear and music is played. Electrodes are attached to the baby’s small head that detect the response of the brain. If the brain of the baby does not respond to the different sounds is a proper and consistent manner, then it indicates a probable hearing problem. If the newborn baby screening test for hearing is not carried out, there is no way to check if your baby can hear till he is a few months old and begins responding to sounds. Cardiac Testing: For cardiac testing, a pulseoximeter is attached to the finger and electrodes are placed on the chest to record the heart beat and pulse. The pulseoximeter can detect the oxygen levels in the blood. If the levels are less than normal, then it raises the suspicion of a congenital cardiac disorder. This testing is non invasive and takes only a few minutes. It is performed only after the newborn baby is a day old or before the mother and baby are discharged from the hospital. If the couple plans to have a home birth, then the doula should be well versed with newborn baby screening test or else they must take the newborn to the nearby hospital or clinic for the screening tests. If the baby is preterm or born with medical complications, then they need to be subjected to a number of procedures and treatments. These can have an effect on the screening tests and so the pediatrician must explain the parents about it in detail. Thus, newborn baby screening test are a very important part of newborn care and they help in early and timely detection of rare medical conditions and hearing disabilities.